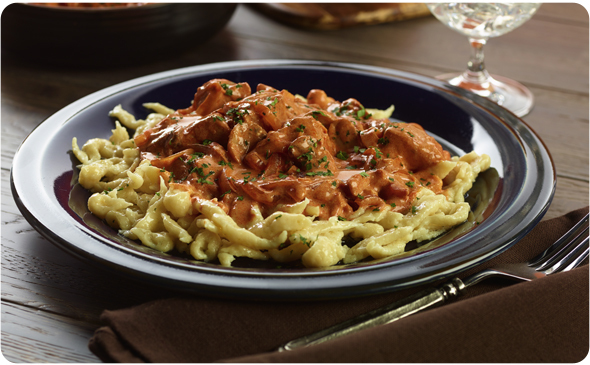 Try this dish with Better Than Bouillon® Reduced Sodium or Organic Roasted Chicken Base. Delicious served with Spatzle. Add the olive oil and butter to a large shallow saucepan over medium high heat. Add the chicken to the pan and cook for 1 minute per side. Add the onions and mushrooms to the pan and cook for 3 - 4 minutes, stirring occasionally. Add the garlic and the Roasted Chicken Base to the pan and cook for 30 seconds more. Combine the paprika and flour in a small bowl. Stir the paprika mixture into the pan and cook for 1 - 2 minutes. Slowly add the water to the pan and stir so no clumps form. Bring the water to a boil, lower the heat and simmer for 15 minutes, stirring occasionally. Remove the pan from the heat and stir in the sour cream and parsley.